“The Lazarus Effect (2015)” movie review. Plot: A group of medical students discover a way to resurrect the dead. Unfortunately, side effects include…demonic possession. “The Lazarus Effect” wants to be a marketable product more than it wants to tell a story, boasting plenty of jolts and a short running time, while delivering very little of substance. While I was watching the film, I will admit that I wasn’t bored or annoyed. The critic in me complained in the background, but the casual viewer in me went along with the ride. 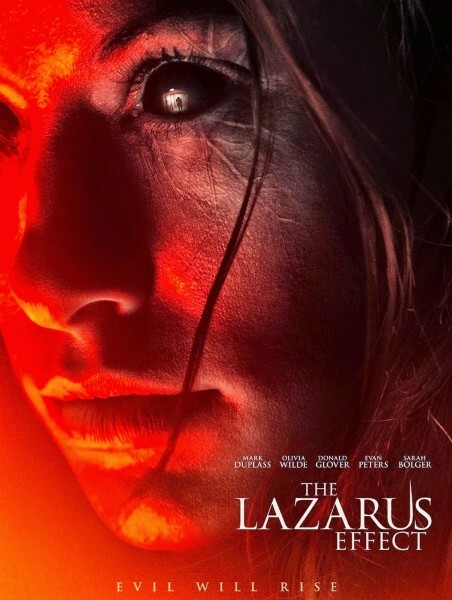 It wasn’t until shortly after my viewing experience that I realized that “The Lazarus Effect” was rather poorly written. Maybe I should praise the filmmakers for their ‘get in and get out before the audience notices the flaws‘ mentality- as this isn’t easy to accomplish, but even though the narrative crumbles once you start thinking about it, I’m still not angry. I’m a little disappointed because there was a lot of potential to be found here, but even that is minimal, as I think the more inspired ideas were more accidental. I personally suspect that the writers just needed to pad out the running time so they could return to the jump scares and it just so happened that their ‘brainstorming’ uncovered a lot of interesting possibilities. But to fully realize them, they would have to develop a more complex script with layered characters, which would mean less jump scares…which would mean the trailer wouldn’t be as marketable. “The Lazarus Effect” is pretty bad, but the end credits seemed to start rolling almost immediately after the opening credits had ended. My first thought afterwards was: “Wow, that was quick“. The characters and their relationships are underdeveloped, with even Zoe’s (Olivia Wilde) descent into madness being nothing more than an afterthought. When she’s resurrected, Zoe is clearly there as we briefly see the events from her POV, so it’s not like a demon is completely inhabiting her body. It just seemed like an evil switch was flipped and her personality changes drastically, without any build up or drama. The film tells us that her relationship with Frank (Mark Duplass) is on the rocks, but we never see any evidence. They seemed happy to me and their chemistry was pretty solid. I kept expecting Frank and Eva (Sarah Bolger) to show mutual attraction, which would allow Zoe’s heel turn make more sense, but it doesn’t happen. So it seemed odd when Zoe went to Niko (Donald Glover) to get some affection, because she wants to feel normal and he happens to like her. Niko was just as suspicious of her as Frank was and she KNEW this. It also doesn’t make sense that he would receive the most gruesome death of the group- which I’m not really spoiling, as the trailers make this the selling point. Maybe a better script would’ve provided actual reasons for this, or at least clarify them, but “The Lazarus Effect” just wants to make the audience scream, and then laugh as the jump scare had just got them. On a side note, Eva is the audience surrogate, but this means she has absolutely no personality. Yet in a way, she is the real protagonist…Why am I supposed to care? There are some pretty cool ideas within the script, but none are explored enough to make any impact. I liked the ambiguity as to whether Zoe has brought hell back with her (possession), or if she is experiencing a rapid form of evolution (like “Lucy“) and hell is merely a manifestation of her guilt. I respect ambiguity and appreciate that “The Lazarus Effect” never clarifies, allowing the audience to make up their own minds. The problem is…I still feel like the writers were just brainstorming in order to give the characters something to talk about and that any hint of intelligence was unintentional. I felt cheated, as none of the clues really add up and all possibilities come with various holes. If she is being possessed, why did she kill the similarly possessed dog? Maybe demons don’t get along? Maybe hell is donating its powers to them and their minds are still intact- albeit now supercharged? But if she has merely developed psychic powers, then why does she keep vanishing and re-appearing for a cheap scare? Half of Zoe’s kills are rather mundane, secretive and quick, so it’s not like she’s interested in psychological torture. Maybe Zoe was twisted all along and her desire for redemption for past acts was nothing more than a desperate attempt to keep out of hell. But even then, there are a few moments where it looks like Zoe might feel remorse, so it’s unclear. This is so ripe with potential for character development and yet I’m making this movie sound deeper than it really is. In fact, I’ve spent more time talking about these possibilities than the movie did. Because the script never goes beneath the surface, it fails to find an identity and this means that you’ll REALLY notice when “The Lazarus Effect” is ripping something off. The narrative is cobbled together of parts of other, superior films. Even the ending borrowed a lot from “Event Horizon“. Also, what was with that evil corporation looming in the background? There are constant reminders that they are watching, but there is never any pay-off to that subplot. Zoe never encounters the group and I was even wondering if they were responsible for the lab being sealed, yet no one even suggests that. Is “The Lazarus Effect” scary? No, but I will admit that the jump scares did often get me. The finale does provide many startling moments, but I felt a lack of suspense and atmosphere. The cast is pretty good, even if the script is relying on outdated cliches. Is this stoner archetype really a scientist? But the actors made their characters somewhat endearing and Wilde is having a blast as the female protagonist. But the greatest weapon of “The Lazarus Effect” is its pacing. Slow burn has become all the rage since the success of “Paranormal Activity” and while that can be effective if done well, “The Lazarus Effect” just wants to get itself over with. It doesn’t take long before the movie starts running and around the half way point, it picks up the pace and never stops to catch its breath until the ending. I was often disappointed and underwhelmed, but never bored or angry. It never made any major mistakes and wasn’t necessarily poorly made. It’s just a standard horror flick that had a lot of wasted potential. “The Woman in Black 2” frustrated me more, although sequels come with higher expectations. “The Pyramid” was significantly worse and even “As Above, So Below“- which WAS genuinely ambitious- tended to fall flat on its face a lot more. “The Lazarus Effect” might be bad, but the badness doesn’t really stand out until you start thinking about it. Violence: PG-13- an R rating probably would’ve intensified things, as the ‘crushing’ sequence lacked an impact. Overall: “The Lazarus Effect” is mediocre. Not a bad netflix rental, but I wouldn’t pay any real money for it. “The Transporter Refueled (2015)” movie review.